When Penelope Barnes arrived at the Home with her young daughter, she discovered a knack for horticulture—and for cultivating the hops needed to produce a superlative pint. She put her scandalous affair with Harry Graham firmly in the past, along with the wrenching pain she felt when he went off to war. After all, she’d always known a farmer’s daughter had no future with an earl’s son. Now she has the pleasant memory of their passion, and she has little Harriet, for whom she would do anything—even marry a boring country vicar. Harry went off to fight for the Crown, unaware that his delightful interlude with his childhood friend had permanent consequences. Now he’s back in England, catapulted into the title by his brother’s untimely death. He sorely misses his former life of unfettered adventure, so when he has reason to explore Little Puddleton, he jumps at the chance. But what he finds there is something—and someone—he never knew he’d lost, and a once forbidden love whose time has come, if only he can persuade Pen he’s home to stay. 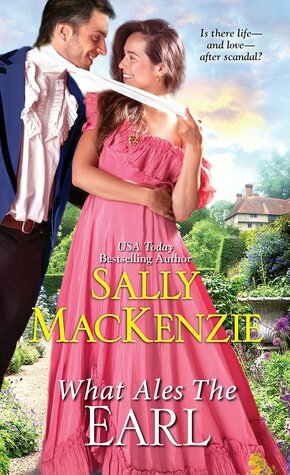 What Ales the Earl by Sally MacKenzie is an interesting twist for a historical romance tale. I never once heard of a young lady creating and maintaining her own brewery. Yet that’s exactly what happens here. A farmer’s daughter fell in love with an Earl’s son. They had shared one romantic moment together before he left for war. But what he left behind was more than just the woman who consumes his thoughts…a surprise awaits him. Harry’s mother wants her son to marry and settle down asap. But Harry is experiencing seconds thought to that marriage promise. The lady is he supposed to marry, talks nonstop. A beauty that she is…but not very good company. While Harry struggles with his new responsibilities, Pen struggles with her own problems. Pen still loves Harry. But she knows deep that a tenant like could not marry an Earl. Harry is above her station. Accepting that, Pen tries to move forward. Marriage to the vicarage is her option. However, her daughter dismisses that notion. She wants her father and mother to marry…but can a union from opposites classes happen? Or will that only tear down the world she has fought to build up for her herself and her daughter? What Ales the Earl is entertaining, fresh, and full of good humor. I loved the intensity of the character’s situations. It made for a fun read. I got to explore rules of society and rules of the heart. When mixed it created a heedy and complicated mixture. One that was worth reading.